Molecular biologist Z. Lewis Liu (right) and technician Scott Weber add a new yeast strain to a corn cob mix to test the yeast’s effectiveness in fermenting ethanol from plant sugars. The yeast produces an enzyme that helps release and degrade biomass sugars, and that could help reduce ethanol production costs. There’s a lot that can be done with a corn cob after the kernels have been removed. Farmers leave the cobs on the field to boost soil quality. Enterprising cooks use the cobs to make jelly. In China, the sugar xylose is extracted from the cob for industrial uses. Now Agricultural Research Service molecular biologist Zonglin Lewis Liu and his colleagues have identified a yeast strain for ethanol production that breaks down and ferments the sugars in corn cobs left behind after xylose has been extracted. And this takes place without the addition of a costly enzyme, a breakthrough that could help make cellulosic ethanol production a cost-effective proposition. The new strain of yeast, Clavispora NRRL Y-50464 (Y-50464), can tolerate cob-derived compounds that interfere with yeast growth and fermentation rates. It is able to grow rapidly at 37°C, unlike its parent strain, which grows best at 30°C. That means it can thrive at the higher temperatures needed to optimize rates of “simultaneous saccharification and fermentation” (SSF), a one-step process in cellulosic ethanol production that combines releasing and fermenting feedstock sugars. Liu worked with technician Scott Weber and supervisory microbiologist Michael Cotta on this project. All three researchers are in the Bioenergy Research Unit at the National Center for Agricultural Utilization Research in Peoria, Illinois. The team started the project with a strain of yeast that had been identified in earlier studies on the use of sweet sorghum as a biofeedstock for ethanol production. Then, in the laboratory, they placed this strain in environments that would promote the expression of genetic traits that favor SSF, including adapting to higher temperatures and tolerating cob-derived compounds that interfere with ethanol production. This resulted in the selection of Y-50464. The team compared how quickly Y-50464 and another yeast strain, Y-12632, could release and ferment the sugar in corn cob residues after the xylose had been extracted. Liu’s star newcomer yeast was able to grow and reach its highest cell density in less than 24 hours after the test began. The comparison yeast didn’t grow at all. In a followup test, the scientists added the enzymes cellulase and beta-glucosidase—which are often used to break down residues and extract sugars—and observed that Y-50464 reached its peak ethanol production rate of 25.7 grams per liter 5 days after the experiment began. But the yeast produced more ethanol—26.6 grams per liter in 5 days—without the addition of beta-glucosidase. In contrast, Y-12632 showed a maximum ethanol production of 22.9 grams per liter after 6 days with the enzyme assistance. But without the enzyme, its production rate dropped to 11.9 grams per liter. Liu and his colleagues sampled protein extracts from both yeast strains to look for evidence of enzyme activity within the yeast itself. They observed significant enzyme activity in the Y-50464 extracts, but did not see any indications of enzyme activity in the Y-12632 extracts. After additional testing, Liu’s group confirmed that Y-50464 contains a new form of beta-glucosidase. Results from this work have been published in Bioresource Technology and Bioenergy Research.—By Ann Perry, Agricultural Research Service Information Staff. 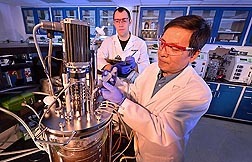 This research is part of Bioenergy, an ARS national program (#213) described at www.nps.ars.usda.gov. Zonglin Lewis Liu is in the USDA-ARS Bioenergy Research Unit, National Center for Agricultural Utilization Research, 1815 North University St., Peoria, IL 61604; (309) 681-6294. "New Bioenergy Yeast Is an Overachiever" was published in the May/June 2013 issue of Agricultural Research magazine.